Mix all of the above. Form into 1" sized balls and place on cookie sheet. Place in oven @ 350 degrees and brown well. Melt BBQ sauce and jelly, simmer 30 minutes. Add browned meatballs to sauce and simmer for 30 minutes, stirring occasionally. NOTE: if you don't have time to do all of this - just buy a bag or 2 of frozen meatballs and put in crockpot with BBQ sauce and jelly. Cook on high for 3 hours or low for 5 hours. Mix all ingredients together and spread over tortillas. 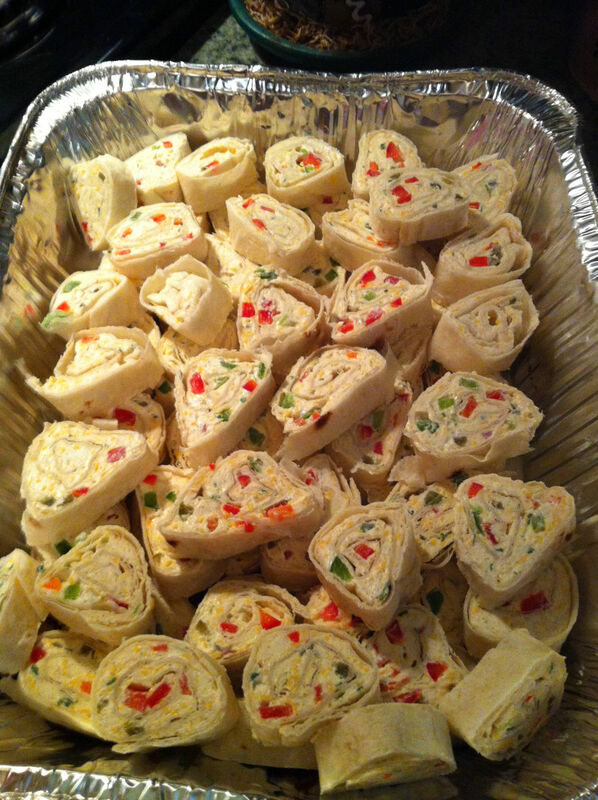 Roll tortillas up jelly roll style and refrigerate 2 hours. Cut into 1/2" slices and you can bake these @ 350 for 12 minutes or eat cold. Tastes great either way. tip: spread on the thin side, less messy and will go further. Also you can adjust how much cumin, cilantro and jalepeno you use according to your taste. I like mine on the spicy side, so use more than what the ingredients state. In med. bowl combine cream cheese and sour cream. Mix well. Stir in chilies, onions and jalepenos. Season with salt & pepper. Spread one tortilla with about 1/4 C. cream cheese mixture, top with another tortilla. Continue spreading and stacking tortillas until stack is 4 tortillas high. Top with with one more tortilla ( do not add cream cheese). Make another stack with remaining tortillas. Wrap stacks in plastic wrap and refrigerate for one hour. Cut each stack into 18 wedges. Arrange pinwheel fashion around cup of salsa, picante sauce or salsa verde. While that is baking, brown ground meat ( about 1 1/2#'s) and chopped green pepper. Drain off grease and add 1 pkg. taco seasoning mix and 1/4 cup hot sauce. Simmer about 5 min. and turn off heat. When muffin mix is done, spread meat mixture on top. Add 2 cups shredded cheddar cheese and pop back in oven for 5 minutes. Top with diced fresh tomatoes, diced green onions, diced black olives and diced jalepeno's. If you like a little extra 'spice' add some fresh chopped cilantro. This is a BAILEY family favorite!! 1/3 C. zesty Italian dressing. Brown chicken in the Italian dressing in batches until browned on both sides. Set aside. Place veggies in bottom of crock pot. 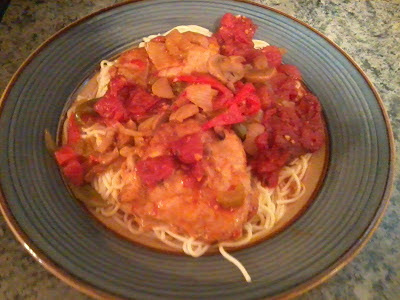 top with chicken. Pour over chicken. Cover and cook on LOW for 6-8 hours or on HIGH for 5 hours. Serve over pasta or rice. Top with parmesan cheese. Cut or snap off the ends of green beans, put in colander, rinse well in cold water. Put into pot, just barely covering beans. Heat to boil, cook beans for 15 minutes, drain and immediately put into a pot of COLD water for 15 more minutes. Drain and set aside. In frying pan, add the bacon grease, saute sliced onions, garlic and mushrooms. Add diced tomatoes and cook on low until the tomatoes only have a small amount of juice left. Transfer to cooking pot. Add tomato sauce, seasonings and crumbled bacon. Cook on low for 40 minutes, or until beans are tender. If you like your green beans less tender, cook for 30 min. 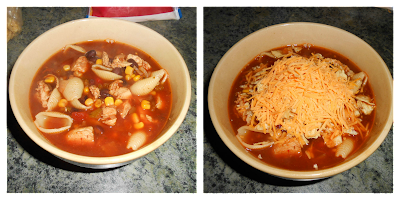 This is a very easy soup to make and tastes DELIZIOSO! I love soup, hot or cold weather. Add a salad and a dinner roll and you have a nice meal! Note: It's better to eat this soup a few hours after it's made so the broth soaks into the noodles. Tastes even BETTER the next day! Cook all of the above until hot. Crush tortilla chips in a large baggie and add as much as you like to individual soup bowls and top with cheddar cheese. I also like to make some sea shell pasta on the side, and when almost done, drain and add to the soup to finish cooking. Tastes awesome topped with heated cucumber sauce. Recipe can be found in SAUCES. Thaw out hash browns and mix with sour cream, soup, milk and cheese. Spoon potato mixture into 12x9 baking dish. Prepare stuffing according to directions, but use the 2 sticks of margerine instead of what directions call for. Might look a bit 'soupy' but that's ok. Spoon stuffing over potatoes and bake at 350 degrees for one hour. Cover with foil for the first 30 min. and then uncover so stuffing top will be slightly crusty. In large saucepan, melt butter, add mushroom soup, sour cream, parmesan, and 1/2 of the Fiesta cheese. Cook on low and stir until mixed well. Stir in Tuna ( or chicken) and add to drained noodles. Top with remaining Fiesta Cheese. After making this tuna casserole recipe...I will NEVER go back to the 'old way', lol it just tastes TOO YUMMY. Yes, it's fattening....but you 'can' cut corners by using fat free or low fat ingredients. My daughter added 1 packet of Shake & Bake to the cheese topping before putting in oven - it was DELICIOUS. Brown all of the above in large skillet. 1 C. cottage cheese, 1 - 8 oz pkg. cream cheese, 1 C. sour cream together. Cook 1 bag bow tie pasta according to directions, drain. Pour half the noodles into baking dish. Place the cheese mix on top, then the remaining noodles. Now add the ground meat mixture. Top with 8 oz. bag shredded cheddar cheese. Combine shortening and sugar together. Add eggs & pumpkin, mix well. Add vanilla, salt, b. soda, b. powder and cinnamon mixing well. Add 1 cup of flour at a time, scraping sides and bottom of bowl so that all the flour is mixed into the batter. Drop by teaspoon onto ungreased cookie sheet and bake at 400 degrees for 8-10 minutes. 1 tsp. vanilla pinch of salt **substitute for buttermilk: add 1 tablespoon of white vinegar OR lemon juice to measuring cup. Then add your milk to fill line. Let stand 5 minutes before using. 1 boxes of vanilla or banana pudding ( We always used the kind you cook but you can certainly use instant). Slice up 2 bananas and mix with pudding. Just spoon as much as you like over each cut piece of cake. I come from a family of 9 so we always made at least 2 packages of pudding and added more banana. dough will be 'gooey'. Drop by spoonfuls over apples and spread with back of spoon. Serve warm with a little milk poured over the apple dickie or with ice cream. Whisk milk, yolks in saucepan. Mix together flour, sugar & mustard. Mix. Stir in vinegar, whisking constantly. Bring to boil over medium heat, reduce to low, simmer til thickened. Combine brown sugar, cornstarch & mustard in saucepan. Cook over medium heat. Slowly add remaining ingredients. Stir constantly until thick and bubbly. Mix well, heat in microwave & serve over salmon loaf or salmon patties. Thanks NeeNee! They all look incredible! Can't wait to try them. Thanks for the great recipes, I am going to try them all.